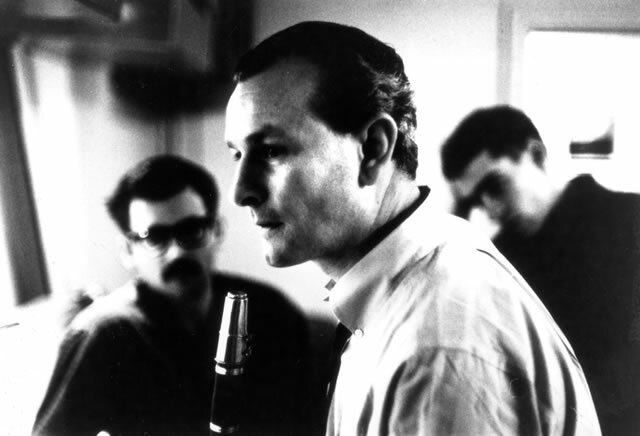 Lately, there has been a goodly amount of press (print and blog posts) on Jimmy Giuffre. With the release of "The Jimmy Giuffre 3 & 4: New York Concerts" (Elemental Music), writers are focussing on the overarching elements of the career of the saxophonist/clarinetist/arranger (1921-2008) - here are links to Marc Chenard's fine review on "Point of Departure" and to Nate Chinen's New York Times article. Giuffre, a native of Dallas, Texas, first came to critical attention as a member of Woody Herman's Orchestra. In 1947, he composed "4 Brothers" for members of the saxophone section (the tenor saxes of Stan Getz, Zoot Sims, Herbie Steward plus the baritone of Serge Chaloff). The piece was an instant hit and there have been numerous covers (especially vocal versions) over the past 6+ decades). 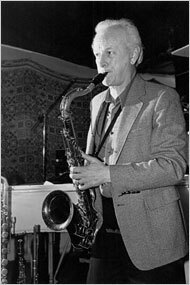 Within in the next few years, Giuffre had become a "free-lance" arranger/saxophonist and became in the West Coast "Cool Jazz" scene, working with Howard Rumsey and Shelley Manne. On a personal note, my introduction to Giuffre's music was the album pictured on the left as well as "The Jimmy Giuffre 3", both released on Atlantic Records. The latter disk, recorded in December 1956, featured the leader with guitarist Jim Hall and bassist Ralph Pena performing a series that shows the influences of blues and country music and how the composer interpreted "bop" and "swing" for a small ensemble. "Western Suite" (recorded exactly a year after "JG3") replaces the bass with Bob Brookmeyer's trombone - the music delves even deeper into blues and interactive improvisations. This was "Americana" music, folksy yet quietly subverting what I thought jazz could be. A few years later, Jimmy Guiffre emerged with a different trio, one that featured pianist Paul Bley and bassist Steve Swallow. 2 sessions for Verve Records saw the light of day in 1961, both sounding more experimental but not without melodic underpinnings. The next year, the trio recorded "Free Fall" for Columbia and now the music had a harsher, angular, edge - this is music about sound and texture, with internal rhythms, breathing, emotional, even dark and it scared off many listeners who loved the Atlantic sessions and, most certainly, it upset me. Over time, I learned the importance of distance, of keeping an open mind, and listened to more "free" music. Once you pay attention to the interactions, take into account that artists need to continue to grow and so do listeners, you come to accept the music. Yes, it's okay to love "Train and the River" but understand that albums such as "Free Fall" and "Fusion" (one of the 1961 Verve Lps) spring from the same explorative veins that fueled the legendary Atlantic recordings. Of course, you do not to have to like any music and you have the right to to your opinion but give the artist credit for not doing the same thing over and over again. Plenty of musicians find creativity within genres, others prefer to experiment. Miles Davis did that throughout his career, Herbie Hancock and Wayne Shorter continue to enter new territories whereas Sonny Rollins finds great creativity moving through familiar waters. Meanwhile, Jimmy Giuffre was stung by the critical backlash to his experimentation (not every writer condemned the projects). After several tours at home and in Europe, the Trio disbanded. Giuffre continued to tour on occasion but rarely recorded after 1962. That's just part of the reason that The Jimmy Giuffre 3 &4: New York Concerts is such an important recording. The 2 CD-set features a September 3, 1965, date recorded live in Judson Hall in New York City (across the street from Carnegie Hall) and a May 19, 1965 concert in an empty auditorium on the campus of Columbia University (Wollman Auditorium, which was demolished in 1996.) Both shows were recorded by then Columbia student George Klabin for his WKCR-FM radio show. Each show aired once and the tapes were filed away. 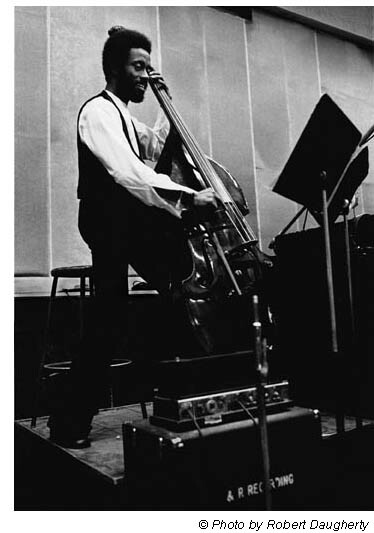 The September gig (it is disc #1) features bassist Richard Davis and drummer Joe Chambers while, on the May recording, Barre Phillips is the bassist in the rhythm section with Chambers and pianist Don Friedman joins the group. Klabin, who now runs Resonance Records (a label that has issued live dates from Wes Montgomery and Bill Evans), had no interest in releasing the music on his label but did the mixing, the mastering and the impressive sound restoration. He also gave his label's Executive Vice President Zev Feldman permission to sell the tapes to Elemental Music, the label owned by Jordi Soley of Barcelona, Spain. And, the music? Giuffre plays a lot of tenor saxophone on both dates and one must note the presence of Joe Chambers (pictured left). By 1965, the drummer (23 at the time) was the first-call for the rhythm section (a seat held on several occasions by Andrew Cyrille and Joe Hunt). One can tell the young drummer has been listing to his contemporary Tony Williams (2.5 years younger and then with the Miles Davis Quintet). Comprising 6 songs (none shorter than 7 minutes), the 51-minute Quartet set covers a wide swath of territory but the interactions and inventions of the musicians catch the ear. This is often very quiet music, with plenty of space so that each player stands out. "Cry, Want", at 9:40 the longest track on the CD (and one that the composer has recorded with Bley and Swallow in 1961), finds Giuffre playing blues figures and more on tenor sax over the very active rhythm section and Friedman's stabbing piano lines. "Quadrangle" stops-and-starts over Phillips' bowed bass with the piano playing percussive lines and Giuffre's clarinet fluttering in and out of the spotlight. The final performance of the set, "Drive", also stresses interaction and themes with rhythms that move from hard- bop to free to a more mainstream approach. "Drive" also appears on the Trio date (in fact, 4 of the pieces appear on both CDs), has a very similar structure (in the liner notes, it states that he often wrote out all the parts and that his groups rehearsed intensely) but stands out for the brilliant counterpoint work of Richard Davis. His bowed works meshes and clashes with the keening tenor sax while his solos are uniformly excellent. He and Chambers create a splendid bed beneath the tenor sax on "Syncopate", pushing and prodding the soloist while he shouts, sputters and wails above them. After Giuffre's wiggles and wails unaccompanied for his solo on "Crossroads" (an Ornette Coleman composition from the mid-1950s), Davis takes over with a muscular solo while his partners create splashes of sound. Chambers starts his short solo loud and works his way down to soft. That sense of quiet permeates the rest of the performance until the rapid-fire restatement of the opening theme. Though it is a shorter set than the one on the first disk (approx. 36 minutes), the Trio makes the most of this dynamic music. Jimmy Giuffre would resume a fairly busy recording schedule over the next 3 decades (including reuniting with Messrs. Bley and Swallow several times) and he never really looked back to the music he made in the 40s and 50s (although the Trio did play a number of "pop" standards.) For many listeners unfamiliar with the man's more "experimental" side, "The Jimmy Giuffre 3 & 4: New York Concerts"are as good a place to start as any. The music does not sound dated or old-fashioned (the sound restoration is excellent); it can be great fun to hear musicians giving everything they can in the service of such creative music. The label has no website nor does Jimmy Giuffre but you should be able to find the CDs and more information about the artist on various sites.